For our first day we scheduled a very light day. I think we ended up shooting three pages. There were only two locations and one actor per location. 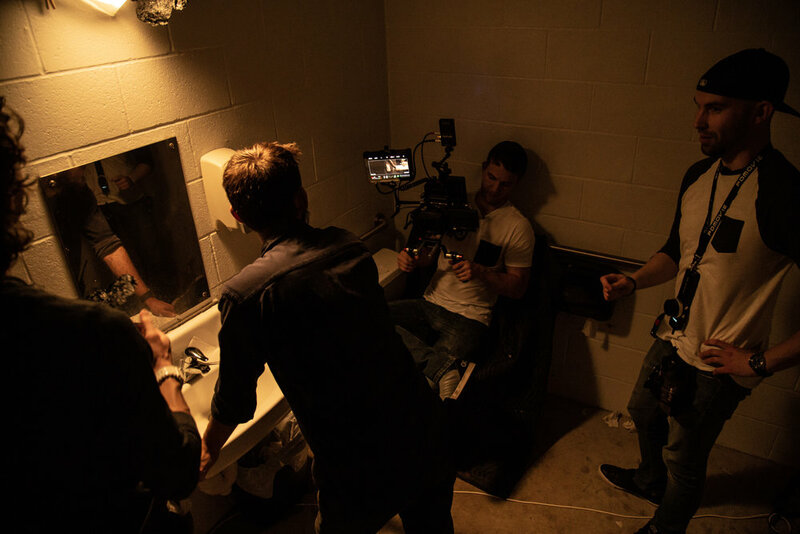 We had nine shots to get in the bathroom location and three shots to get at our second location, which was going to be shot inside a van. I think it’s best to start any film with a light day to get things rolling smoothly right off the bat and make everyone feel good about what we accomplish. And it was very important to get off on the right foot with a project as ambitious as ours. The day before our shoot, the Lomo anamorphic lenses came in, and we did tests in my backyard. We also took the camera to our first location, a public restroom that was a couple blocks from my house, to start lining up some shots. I saw very quickly that I was going to have to readjust some shots to fit in the tight space and the minimum focus distance of our lens set. So that night I changed around the shot list. ur original wide shot became a medium, and I came up with a completely different wide shot. That night I got plenty of sleep which was very surprising. It helped me focus and be present during our shoot. When the day began, the crew arrived at my house where we were staging. A few minutes later the lead actor arrived and immediately went into makeup (the makeup artist was already there because she crashed at our house for the entire shoot). The crew and I were still testing out the lenses, because we had just gotten them the day before and were still learning the ins-and-outs. We discussed what aperture we would like to stick to throughout most of the shoot (2.8 for interior and a 4.0 for exterior). I like shooting as wide open as possible, but Austin requested that for exteriors we shoot stopped down a little more so focusing wouldn’t be as much of a headache with all of our camera moves. I was very excited about anamorphic. When I first wrote the screenplay, I always knew the dream would be to shoot the film that way, but immediately I came to the conclusion that it wouldn’t be possible. But once I found a set that our budget could account for, I jumped on the opportunity. With that being said, I always keep in mind that gear is not everything, so I limited my expectations. However, when we actually got the glass, I did fall in love all over again with the look and feel. The distortion in the out of focus areas, the oval bokeh, the dream-like lack of sharpness were all magic. It all added just as much character as I’d hoped it would. With that being said, we were only getting the lenses for eight days, so if we needed any pickups, they would have to be shot on spherical glass. I was okay with taking this risk. t is something that kicked our butts in the end, because we did end up having to get a scene a week after principle photography. So renting expensive lenses you know you aren’t going to be able to match with your own lenses is a red flag to consider when you are picking gear for your own project. I understood the risk and took it, and I really don’t regret it. But before you decide to take that risk, it’s important that you really understand it. And I will admit, the scene we had to pick up later does feel different from the rest of the footage we shot. I think a lot of the filmmakers who watch the film will be able to tell. However, the difference doesn’t completely ruin the film; it’s just definitely something to consider. Another aspect of shooting on anamorphic lenses is the infamous lens flare.I didn’t want to sell my use of the lenses on gimmicky flares like I’ve seen a lot of other indie filmmakers do. What I loved about the anamorphic lenses were the things that wouldn’t be obvious to the average movie goer.But I quickly learned on set that you don’t need to shine a flashlight into the lens to get an insane amount of flaring. There were plenty of scenes that had unexpected flares I wasn’t necessarily wanting, but you have to just go with it. As much as you try to control these 40- year-old lenses, at some point you have to just give up and let them take you on a journey. It’s the same story with the minimum focus distance. We didn't have the budget to rent diopters, so we were stuck with a close focus of 3.5’ on the 35mm. It wasn’t what I was planning on, but I just had to let it go and frame things differently. We did miss some extreme closeups we needed that I had to grab later -- that is an area where the minimum focus distance can screw you over. But this has to do with getting familiar with your gear ahead of time so you can plan a shot-list accordingly. Back at my house, my 1st Assistant Director Wyatt Weed arrived, and everyone started getting their walkie-talkies on. I decided to wear a walkie, too, in case I needed to communicate with my DP Austin McCardie, as I was in video village and he was shooting. But honestly, I took my earpiece out an hour later so I could hear better; and it immediately became a hindrance. This was the first and last week that I would wear a walkie. I guess you don’t usually see directors with a walkie for a reason: it’s more of a burden than a help. The only gear I had in my “director’s kit” was my iPad loaded with the app ‘Shot Lister’ and a binder. In the binder I had the screenplay, a hardcopy of the shot list, call sheets for every day, and our schedule. After we all got our ducks in a row, we started making our way to set. I rode with Wyatt and went over my plan for the day. The lighting team had already been down there for about fifteen minutes before we got down there, so they had a head start. We got video village setup for me and my script supervisor, and I walked my actor through the blocking of the scene. Really nailing down the blocking before you start rolling is essential for keeping track of continuity and making sure the vision for the scene doesn’t get convoluted in the middle of shooting. It was especially important for this scene where the actor had to handle several props and place them in specific places each take and each shot. We started with our wide shot and moved into our medium/profile shot. A number of interesting things took place during the medium shot. For one, we filmed two different variations. Our actor was taking props out of his suit jacket and observing them. So to maximize our coverage and schedule, we did a take that stayed with the actor’s hands and the props, then did a separate take just on our actor’s face as he looked at the props. If the location had been bigger, we would’ve been able to just back up the camera and get everything in frame, but that wasn’t an option. Getting two separate takes was a great way for us to get all the coverage we needed and not add another setup onto our day. The second issue we dealt with was makeup. Our actor was supposed to have a bruise on his head for the entire scene, and the bruise was going to last for the whole shoot, appearing in almost every scene of the movie, so we needed to get it right on day one. We went through a couple of variations before we started shooting, but I still wasn’t happy with the result. It looked like someone just stuck a big bulge of dark blue cake icing on his forehead. Luckily, our first shot had our actor facing away from the camera so we didn’t see the bruise. So before we got into covering our medium shot, I pulled my 1st AD aside to chat for a second (this was one of many instances where I pulled Wyatt aside onset). I told him how I was feeling and asked if he thought I could get away with redoing the bruise, from a scheduling standpoint, before we did our next shot, which would clearly show it. At that point we were already shooting and a little behind schedule, so I was hesitant. But he said it was a smart idea and that we needed to get it figured out now instead of later down the line. I went to Halle, or makeup artist, and told her how I was feeling and that I wanted to simplify the effect, so that instead of it looking like icing packed onto his forehead it just looked like a bluish/purple segment of his forehead. I think the subtly sold the effect, and I was satisfied with the decision. That was the most stressful part of day one. I was very worried about continuity, but between my lead actor, Scott, being incredibly responsible and paying attention, as well as my script supervisor watching the monitor like a hawk, I felt very confident. Speaking of which, the script supervisor is such an underrated position! Karen Garcia, who I brought onto the project, was invaluable, and I can’t imagine working without a script supervisor. Yet, all of the short films I have worked on haven’t had one. I think the position is so important for a director and, especially, the editor. So tip to indie filmmakers: have a script supervisor! As far as sound goes, I didn’t have feed on this day. For one, there was no dialogue so it wasn’t crucial for me to be listening. But also, we didn’t rent an IFB system (wireless audio) that the script supervisor and I could use whenever we wanted. For the rest of the shoot we just setup video village next to sound and my script supervisor and I got headphones that were plugged directly into the recording device. But I do wish we had rented IFB. It would’ve made all of our lives a lot easier. It’s definitely something I am doing next time. Having an audio feed is very important and overlooked on smaller sets. It’s also just as important for your script supervisor to be listening in to keep track of lines of dialogue. It just brings you closer to how your audience will experience your film, which will affect your decision making on set. Imagine not having a monitor to look at while you shoot a scene. It’s just another great tool for making sure things are working properly during production so you aren’t screwed over in post. After dealing with makeup, we took our time, wrapped up the bathroom scene, and broke for lunch. The bathroom scene is probably the closest we got to my original vision compared to the rest of the shoot. When I wrote the script, I knew exactly how I wanted to shoot it. I made it clear to Curtis, my gaffer, in pre-production, that I wanted it to be a warm, top lit, very dim scene. I always knew I wanted a lot of contrast. And I walked away feeling like we got around 70% of what was in my head, which is rare for me. 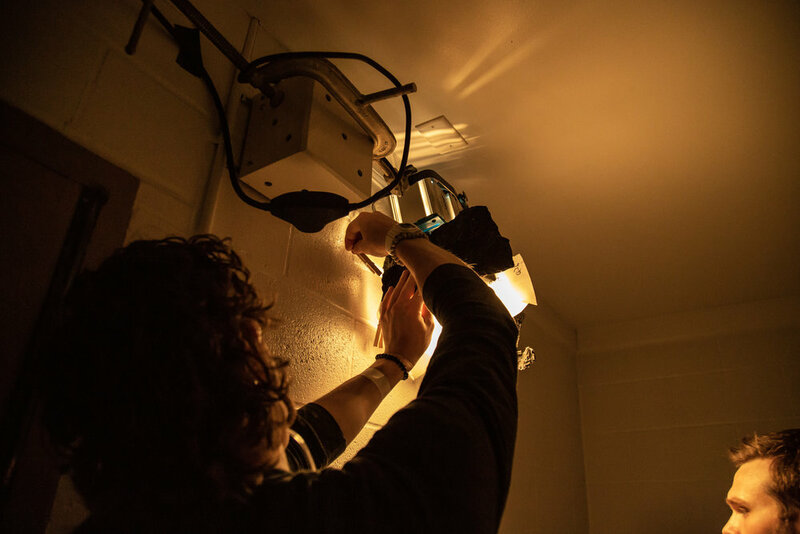 One of the issues we had to deal with on that scene, was there was a fan in the bathroom that had a motion sensor, and everytime the door was open the fan would turn on for about fifteen minutes. So before we shot the scene, Curtis just went up on a ladder and unscrewed the fan from the ceiling and unplugged it. That was a empowering moment where we got to temporarily destroy a part of our location. But, of course, we did put it back together before we left. Something I learned from this day, was how much of a perfectionist I am on-set. In pre-production I was very particular, but I didn’t know 100% of that would carry over — but it did. I was very particular with how I wanted every little hand movement and action in the scene. In the bathroom scene, Scott is supposed to splash water in his face. I told him that I wanted it to be very violent and that I almost wanted him to slap himself in the face more than splash water. And I think Scott was able to keep up with me and deliver. 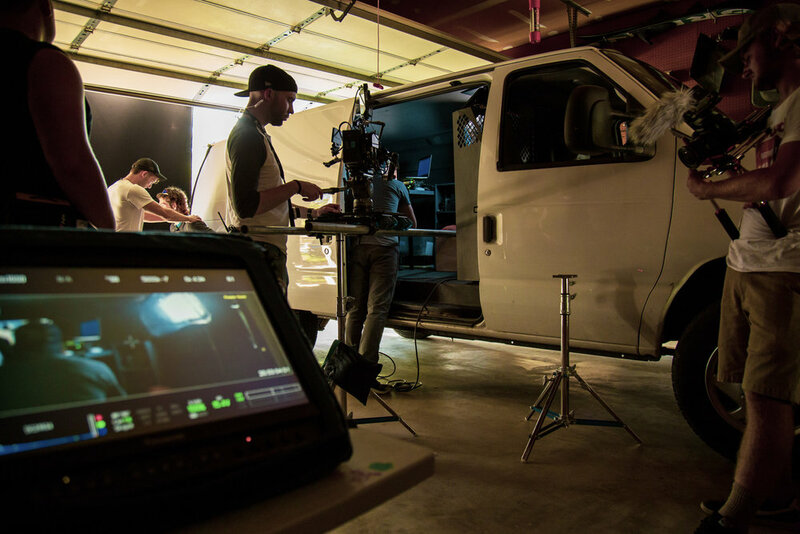 So after lunch, we started setting up in the garage for a scene that was going to take place inside a van. This was actually a fairly challenging scene to shoot and required me to stretch my directing muscles. The first issue we ran into was that the van was actually too big to fit in my garage, so we couldn’t close the garage door and block the light. So we ended up throwing up two 4x4’ floppies behind the van to block the sun. The other issue we ran into, was the actor hadn’t memorized all of his lines because he was under the impression he would only be delivering one of the lines. So I think, due to all the pressures of being on set, he really struggled to keep the lines straight; and therefore his performance was coming off as unnatural.After doing a take, I knew I needed to do something so he wouldn’t focus so much on the actual lines. So I ran into my house and got him a coffee mug full of water. And during the scene I had him pick up the mug as he delivered his lines. I think it made his performance much more natural. I really think if your actor is having a hard time performing in a scene, giving him something physical to do will really help him forget about “performing” and just deliver his lines while focusing on the action. If you aren’t happy with how a scene is going, don’t freak out. If something isn’t working, try something new. And when an actor is struggling, I have to be mindful about how specific my direction is because sometimes they will overthink it. I have a massive problem with being overly specific with direction. It’s important to direct from a character’s point of view. What is the character’s motivation? Sometimes the trick is simplifying the scene so that he can forget about the acting part of it and just do it. At the end of the day, he still wasn’t pleased with his performance; and if the crew hadn’t already been tired and had the scene been a crucial part of making the film work, I would’ve kept going and done as many takes as needed. But Wyatt quietly asked me, “How important is this scene and will doing it over and over again really change anything?” So I had to stop and consider where I was at and how I wanted to handle it. And I decided that good enough for this scene would be good enough, especially since it was a relatively short scene and everyone was exhausted and working for free. So after about seven takes, we moved on, got two more shots, and wrapped. One continuity issue we ran into had to do with the set dressing. In the background, playing on a monitor, there was supposed to be security camera footage. It was a video we had created beforehand that we had playing on repeat. I instructed the actor to move the mouse on the computer every time we did a take to hide the scrubber bar at the bottom of the screen. However, that quickly was forgotten, so all the takes besides the first one have the scrubber bar at the bottom. In hindsight, I should’ve just had our props/set dressing department keep an eye on that throughout the scene instead of assigning that task to an already struggling actor. This is something we did every night. Our DIT/behind-the-scenes crew member, Stephen Littmann (who is awesome), was staying the night at our house for the entire shoot. So each night we would transfer footage from our backup drives to the editing RAID array, and I would stay up reviewing some of the shots. I do remember feeling like an idiot while looking through the footage of the van scene with the monitor in the background. As far as cinematography in that scene, in the shot list the first shot was a push in/profile shot of the actor sitting at a desk with computer monitors in front of him. 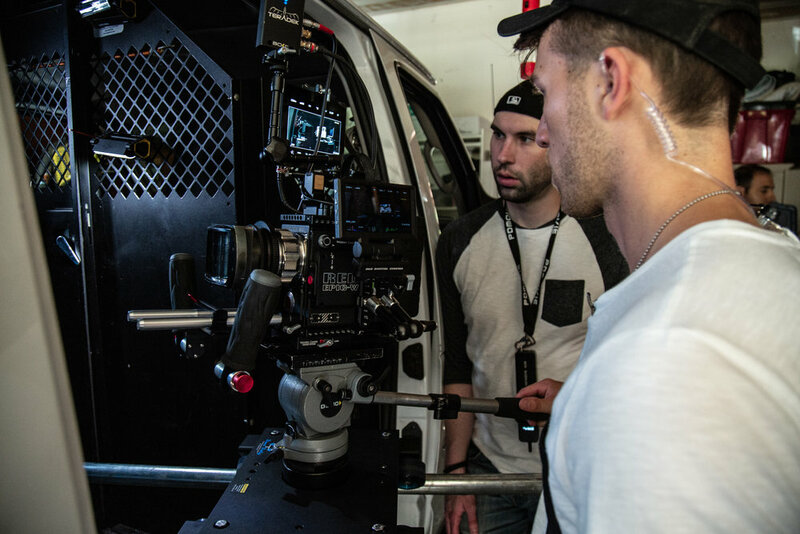 Seeing as we couldn’t fit a dana dolly in the back of a van, we switched that to a cool shot of the camera entering through the side door of the van and panning. Finally, I have to give a major thanks to our props/set dressing crew member, Jennifer Horton, who went above and beyond with decking out this surveillance van. In pre-production I was thinking very simplistically in regards to how the van was supposed to look. I thought it would just be a table with two computer monitors and a keyboard. But Jennifer went all out, really putting a lot of time into the details of each nook and cranny. In pre-production, I didn’t know what to make of Jennifer’s talents, I hadn’t seen her work previously, and so I had my expectations set reasonably. I didn’t know if they were going to be “workable” props or really great props. But she really went above and beyond and was able to take what I brought to the table and go a step further - which was more than I could’ve asked for. And I really didn’t realize how important set dressing was until Jennifer went all out with the surveillance van. In the van we connected an audio recorder to an iPod and played a song on a loop to show waveforms. There were tons of little pieces of tech sprinkled throughout that really added nice touches to the scene. After we wrapped I hung out with Wyatt Weed (1st AD) in my kitchen for a few minutes and discussed how the day went and what our game plan was for tomorrow. We were able to look at problem points on day one and assess how things should flow come the next day. And we both felt great. I got what I wanted, and Wyatt felt everything ran smoothly, which reinforces the importance of starting off with a simple and smooth day to get things off on the right foot.